Last week’s Pentagon briefing outlined plans for Iraqi and Kurdish forces to retake Mosul from Islamic State, also known as ISIS. This strategy largely assumes that if ISIS is expelled from Mosul, Iraq’s second largest city, pushed out of Anbar province and degraded in Syria, the organization will collapse because its narrative of victory will be tarnished and its legitimacy as a “Caliphate” will end. That may have been true some months ago. But ISIS has adapted more quickly than U.S. strategy has succeeded, and it is pursuing a deliberate strategy to offset its tactical losses in Iraq and Syria with territorial gains in the Mideast and globally. ISIS’s often stated objective is to “remain and expand.” This is not a mere defensive measure to preserve its combat power from destruction. Nor is it a mere recruiting slogan designed to replace some 6,000 ISIS fighters that Washington estimates have been killed since U.S.-led coalition airstrikes began in August. As Ms. Gambhir concludes in her recent Institute for the Study of War “ISIS Global Intelligence Summary,” open-source reporting indicates that ISIS is executing a complex global strategy across three geographic rings. What the intelligence summary calls the “Interior Ring” is at the center of the fighting and includes terrain the group is named for, specifically Iraq and al Sham—i.e., the Levantine states of Syria, Jordan, Lebanon and Israel-Palestine. The “Near Abroad Ring” includes the rest of the Middle East and North Africa, extending east to Afghanistan and Pakistan. ISIS has claimed auxiliary operations or established what it calls “governorates” across this region. The “Far Abroad Ring” includes the rest of the world, specifically Europe, the U.S. and Asia. Here ISIS is most focused on nearby Europe, which it terms “Rome” as a reference to the Byzantine empire, the great power adversary in decline during the rise of the early Islamic caliphs. ISIS distinguishes between established Muslim lands and those that host Muslim diaspora communities, and it uses different but interlocking strategies in each ring to expand its influence. ISIS’s primary mission on the Interior Ring is defending the current territories it controls in Iraq and Syria from counterattack and undermining neighboring states. ISIS has suffered heavy casualties, mainly due to airstrikes by the U.S. and its allies and the effectiveness of forces on the ground, including Kurdish Peshmerga, the Iraqi Security Forces, and Iraqi Shiite militias. ISIS has lost the Syrian border town of Kobani, but it has not relinquished its strongholds in the Syrian cities of Raqqa or Deir Ezzour. Most important, its goal is to maintain control over Mosul, a city with more than a million residents, Fallujah and large swaths of Iraq’s Anbar province, where it is still carrying out sophisticated attacks. This defensive stance in Iraq is one component of a larger strategy to regain the initiative elsewhere. ISIS’s recent foray into Libya, and its hostage-taking and executions of Egyptians and Jordanians, are a clear attempt to provoke offensive operations in those countries, and as such have largely succeeded. The goal is to polarize domestic populations to deter participation in the U.S.-led coalition against ISIS. The longer-term goal is to cause multistate failure in the region that spreads from the Interior Ring. 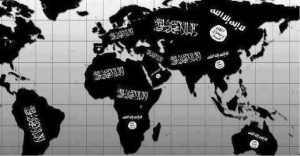 The primary mission of ISIS in the Near Abroad is territorial expansion. ISIS recently announced so-called governorates in Libya, Egypt’s Sinai Peninsula, Saudi Arabia, Yemen, Algeria and “Khorasan,” the historic name for a region covering parts of Afghanistan, Pakistan, Iran and India. The list may soon include the Caucasus. Its strategy in the Near Abroad is to find organized local groups and seed them with resources and training to increase their combat effectiveness. ISIS is also fostering relationships with local jihadist groups capable of conducting simultaneous, independent military operations, especially in Libya and Sinai. These satellite groups, such as the Islamic Youth Shura Council in Libya and Ansar Beit al-Maqdis in Sinai, can shape local conditions and prepare the ground for ISIS’s future expansion. Elements from the al Qaeda affiliate in the Caucasus, for example, recently defected to ISIS in part because of its more effective military organization. Once focused on recruiting radical Islamists in Europe and elsewhere to join the fight in Iraq and Syria, ISIS now also encourages them to remain at home to recruit others and launch local attacks, such as those in France and Denmark. These attacks are intended to polarize Western societies and deter strikes on the ISIS core ruling stronghold in Iraq and Syria. ISIS believes this polarization will lay the groundwork for an all-out war with the West when the time comes. In short, ISIS has adapted to the U.S.-led coalition campaign in Iraq and Syria by rapidly building a regional and global network that it can use to recruit and attack. In this way, it may well be able to sustain its global terrorist campaign if it loses terrain in Iraq and Syria—perhaps even if it is driven out of that region. Nevertheless, the sustained control of territory in Iraq and Syria is essential to the legitimacy of ISIS by the terms they have set for themselves. Defeating ISIS there will deal the organization a severe blow. It will not, however, end the threat from ISIS either in Mesopotamia and the Levant or around the world. The ISIS cancer has metastasized, as the al Qaeda cancer did before it. The two are now competing to see which can kill more people faster. It is past time to recognize the scale, scope and magnitude of the enemies America and its allies face and develop clearly stated global, regional and local strategies to fight them.